The Camino has been an important and popular pilgrimage journey for years for Germans and they represent one of the largest groups of overall pilgrims from around the world. In march of this year they represented 24.8% of all pilgrims making their way to Santiago de Compostela. A longstanding tradition that continues to become even more popular every year with more German pilgrim’s venturing to Spain for the Camino experience. It has been a very special part of my Camino journey while living here in Galicia to meet so many germans from the historical country of my family’s heritage. As I am part German, French and Irish i can relate on many levels to the camino from the different aspects of my family cultural background. So many wonderful Camino journeys to make – the list literally appears to be endless!!! 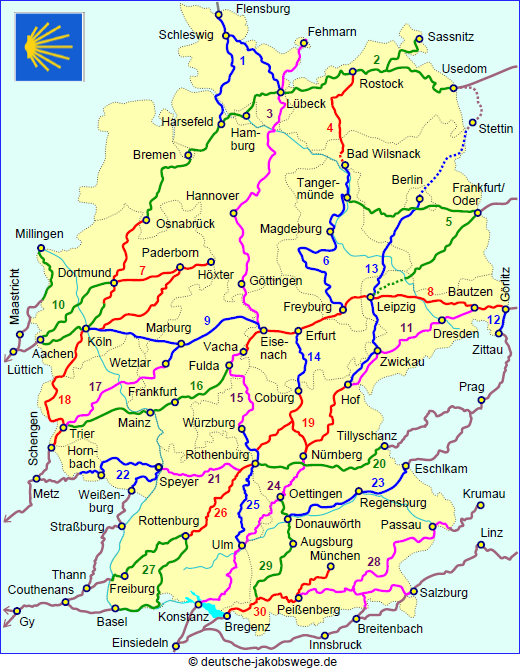 Learning of the different routes and starting points for the camino in Germany are extensive and in just looking at the map you can see that from all parts of the country pilgrims were beginning their ancient journey. One of those famous routes is known as the Palatine Way of St. James. “Several such pilgrimage routes within the Palatinate have become known. Two, the North Route (Nordroute) and the South Route (Südroute), begin at the River Rhine at the imperial cathedral of Speyer and end in the small town of Hornbach (Südwestpfalz county), where the grave of Saint Pirmin is found in the former abbey. South of Hornbach the now united pilgrimage route crosses the border into France. Both Palatine routes are waymarked by the Palatine Forest Club and one link to the French pilgrimage routes follows. In the Palatine Forest old footpaths have been identified as parts of the Way of St. James. This entry was posted in Camino Travel Tips and tagged camino, Camino de Santiago, Camino de Santiago de Compostela, culture, history, Jakobswege, nature, outdoors, Palatine Way of St. James, Pfälzer Jakobswege, spirituality, The Way, traditions, Travel. Bookmark the permalink.